For a Church to be the Body of Christ it must teach accurately about salvation. It must clearly proclaim how people can be saved from God’s coming wrath on this evil world. God has freely given us this salvation which is independent of any human effort. We only have to accept it by faith. This in no way denies the importance of believer’s baptism or meeting together or living a godly life, pleasing to God. However, the clear order is: GOD’S GRACE is followed by OUR FAITH. This equals OUR SALVATION, followed by OUR GOOD WORKS. Our good works and obedience are our response to God’s free gift. But they are our appropriate response, in order to please God. Our teaching should be clear. When Paul and Silas were asked this question by the jailer in Philippi, they didn’t beat around the bush, and neither should we. They replied, ‘Believe in the Lord Jesus’. [Acts 16:31] Then they explained the gospel to them and what did the jailer and his family do? In other words the jailer responded in faith then immediately set out to do good works and obediently submit to baptism as a sign. Notice that the jailer was not saved by trying to please God by doing good works first, but he was saved by BELIEVING God first, then acting. When he had been saved he was told by Paul and Silas about the fitting response to God’s grace – which is obedience. So he was baptised and changed his way of life accordingly straight away. The Church today ought to be sounding out this message in the right order. I know of people in some Churches who are still very fuzzy on this point – mostly because they have not been taught clearly or searched it out for themselves. Many times their leaders have not been much help either. And some Churches have got it altogether wrong, by adding to those requirements as well as confusing the order. 1. The Catholics teach that only through their Church can salvation be obtained, and then only by the grace of God which only comes through the sacraments and the priest. 2. The Seventh Day Adventists believe that we have to earn our salvation by doing something and obeying their made-made laws relating to diet and Saturday worship. This is easily refuted by Paul’s teachings. 3. The Calvinists and Reformed Churches say [correctly] that whatever we do will have no effectiveness in obtaining salvation. However they are wrong biblically if they do not understand that our good works and faithful obedience are necessary parts in proving to everyone and ourselves that we are saved. By downgrading the book of James, which stresses the need to live according to our faith, they have made a theology which can tend to make Christians lazy, ignorant and poor witnesses. Also, they tend not to understand the point that true FAITH actually INVOLVES doing the good works of the Master in whom we have that faith. Paul in Colossians 1:9-14 explains how, while we have already been rescued from the Kingdom of Darkness, we should be living a life pleasing to God, bearing fruit and not just sitting idly on our hands. Please click to enlarge the diagram below. According to Colossians 1:13 spiritually we have already been rescued by God, who has transferred us from the black rectangle on the left to the white one on the right. BUT, as long as we remain on earth there are 5 points he makes about how we should be living. 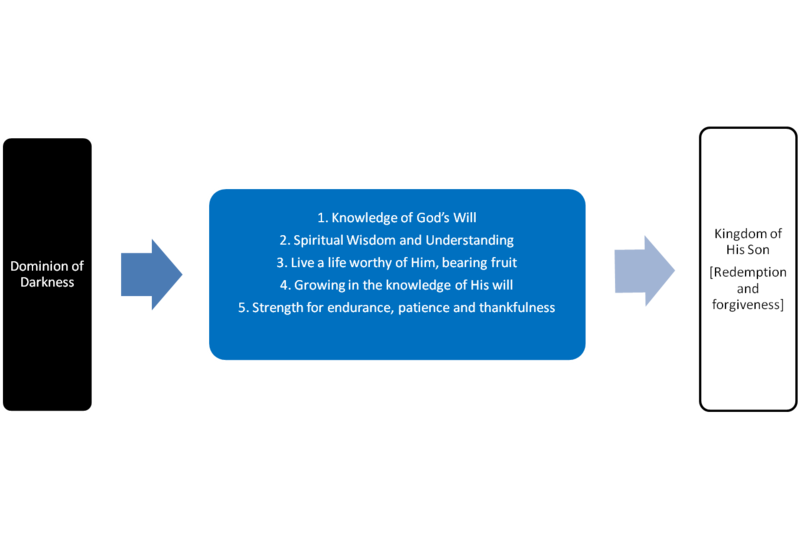 It all starts with a knowledge of God’s will and it results in fruit-bearing, endurance and thankfulness. Since we have already been saved out of the Dominion of Darkness into the Kingdom of Light, it is our duty to preach exactly what Paul teaches in Colossians 1 for example. Christians in the pews must understand exactly where they are, according to the Bible – not according to man. He must teach obedience and the need for good works, the same as Paul and his Master did. I hope your Church leaders are faithful to the Scriptures in this regard.